Quennie and I, and other Takbo.ph Forum members, joined the 1st Annual Run Barefoot Clinic held last November 30, 2010 at R.O.X. 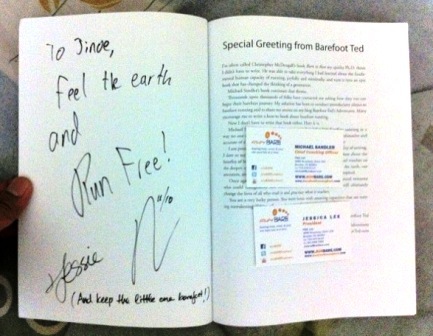 The speakers where no other than the authors of the book Barefoot Running: Michael Sandler and Jessica Lee. The clinic was a short one but full of insights from both Michael and Jessica. During the clinic, we get to hear great tips on how to run barefoot and even got ourselves running barefoot outside ot R.O.X.. I admitted that I haven’t started reading the book yet since I am still finishing one book right now. But I was able to browse and scan thru the page and got the feel of how the book is written. After the clinic, I was able to have my book signed by Michael and Jessica. What a privilege. Feel the Earth and Run Free. Thank you Michael and Jessica. Hope you will enjoy your honeymoon in Boracay next week. You deserve lots of rest, lots of vacation and lots of love. 😀 Hope to see you again. More about the clinic and some tips and news from the authors themselves in my next post. You can browse some of the photos from the clinic at the Takbo.ph Facebook Page. Click HERE. Thanks to Terra Plana and Vivo Evo Barefoot Shoes for inviting us to be part of the running clinic. Know more about the product at the Barefoot Store in Facebook. Click HERE. Check out more books on running at Amazon.com.